Manufacturers strive every day to improve efficiency. Our latest achievement in this area is a production levelling system that we have developed ourselves. We visualise how human and production resources are distributed in production. The objective is to optimise the work load. This is all in line with our Lean and continuous improvement culture. 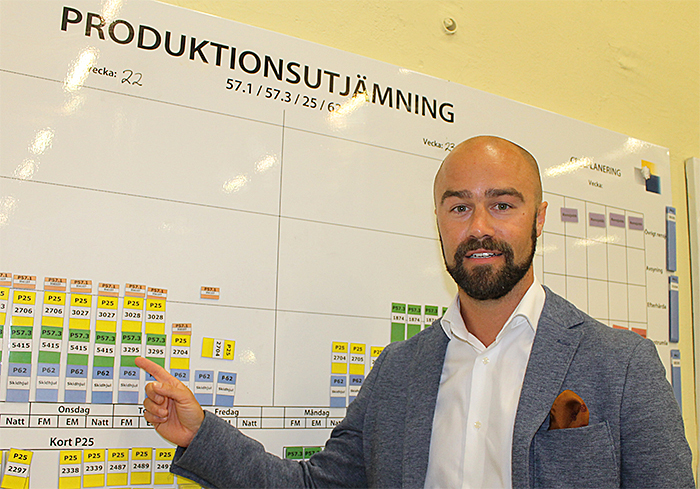 We have implemented the new production levelling system in one of our four production cells in our Halmstad plant. 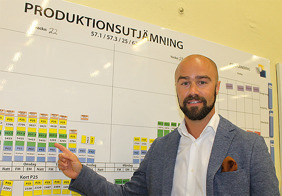 “When the layout was changed, we decided to improve the efficiency”, says Mr Jon Stibe who is the Production Manager. “The result is a better distribution of the work load”. The project started in December 2015 and the system is now up and running. Every product has a colour coded card and the size of the card indicates its work load. The cards are placed on a board in the factory. The amount of cards, i.e. the work load, indicate how many operators are needed per shift. If the column of card surpasses the line indicating one operator, then more personnel is needed. This system avoids peak workloads and simplifies personnel planning. The production is levelled and the efficiency has increased by 7%! Our new production levelling system has caught the eye of other industry colleagues. Mr. Stibe explains how employees from a visiting company adopted the idea in their company to improve their efficiency.